It was December 2016 when headhunters caught me to undergo a hiring job caravan. Offering first a free meal from a fast food located along Ayala avenue, next to USANA Philippines office where it is my scheduled to-do list visit with a friend: to attend a seminar. But headhunters really managed to divert my sched to go to job hiring process intead. What a great job these headhunters did!!! Hahaha. 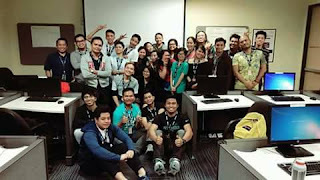 At around three o'clock, we headed to the Alorica office, just a few blocks from Ayala avenue, undergone the long process of hiring in a call center: initial, online and final interviews with different HR people. Long process because of the long hours of waiting time in between. We log our details in a computer, wait for our names to be called, and so on and so forth. During long wait, we, applicants managed to talk to each on different topics, so an air of friendship was born for a little time. No one bothers to get contact numbers and Facebook accounts, may be for a simple 'nahihiya' thing at first. At first, there were many of applicants, but as night goes deeper, only few remain standing for the final interview. We wait for hours for the finals. There were six of us that time, unfortunately only two didn't pass the final interview. Only four proceeded to sign the job order: John Carlo Abella, Miasayo Fontanilla, Williamson Pineda and yours truly. We are all required to report on January 5th for orientation program. From there, I met my wave mates. We are under batch 226a. Training starts January 9th, our goal is to finish the 40 training days. We are 24 hopefuls to finish the training days. Here are the list of 24 hopefuls, in sitting arrangement: John Harvey, Laurence, Patt, Joana Marie, Alona, Jessie, JC, Cy, Eric, William, Mia, Ex, Majo, Joy, Dave, Melvin, me, Marky, JL, Egay, Jaja, Pham, Dahlz and Blue. Thanks to our trainers: Denise, Rob and Reeno. Everyone of us passed the accent training, so everybody must be serious enough to pursue to be one of the agents in the BPO industry. Although it is always maligned by others by putting the industry in bad light in the Philippines, one must be brave enough to be in it. Simply because we do customer service insanely great and awesome. Most importantly, a significant percentage of our hard-earned salary is contributed to the development of the Philippines by means of tax collection. As of this writing, only 14 of us are now working at production floor, doing great things for customer's great experience. The next two months will determine our abilities on becoming regular status employees.